The company Gaćina Adriatic Charter d.o.o., established at Šibenik, Bana Josipa Jelačića 13 b, VAT No. 50286165539 (Gaćina Adriatic Charter in further text), in running its business needs to collect and use certain personal data. This policy has been written and implemented to assure that Gaćina Adriatic Charter operates in accordance with its legal, organizational and technical obligations regarding the protection of personal data. 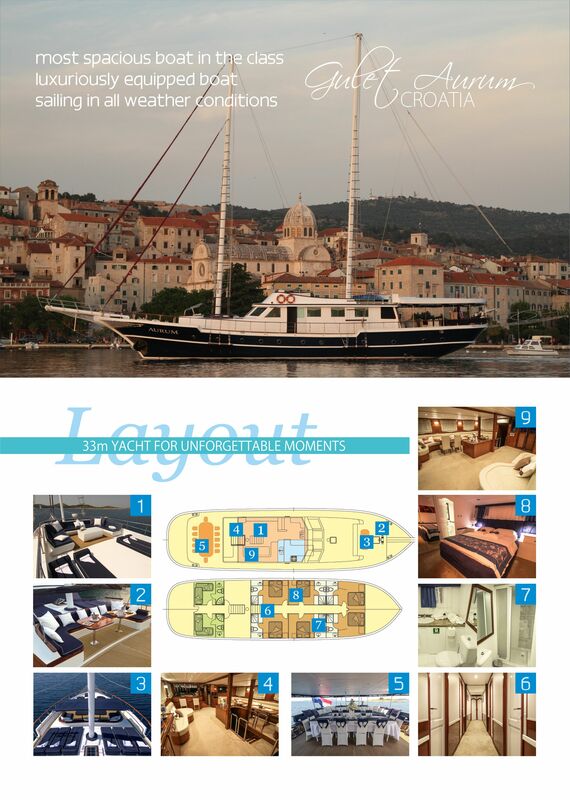 All Gaćina Adriatic Charter's employees are fully informed of the contents of this Policy. They assure its application when handling and processing personal data. The employees whose tasks include handling and processing personal data have been properly trained on their duties regarding protection of personal data. This Policy applies to all personal data stored by Gaćina Adriatic Charter, relating to any natural person, regardless of her relation to the business, whether she is, she was or she might become a client, a supplier or a contact-person. This Policy has been implemented to prevent potential damages to Gaćina Adriatic Charter and its employees and subjects as well as to assure that processing of personal data be fully aligned with the applicable laws and other regulations. Gaćina Adriatic Charter collects and processes personal data mostly for providing services within the scope of its business. That is why Gaćina Adriatic Charter needs to collect and process certain categories of data about persons whom it has contact with (subjects). Gaćina Adriatic Charter handles these personal information in appropriate manner, regardless of whether the data are obtained, recorded, stored and used in a paper copy, on a computer or any other media. When giving her data to Gaćina Adriatic Charter, the subject consents that Gaćina Adriatic Charter process her personal data in accordance with the declared purpose. Subject’s data privacy is permanently protected. At any moment, subject can exercise her rights, as listed and explained below. Gaćina Adriatic Charter gathers and processes subject's personal data in accordance with the Law on the Protection of Personal Data (OJ 103/03, 118/06, 41/08, 130/11, 106/12), other applicable Croatian regulations, the European Directive 95/46/EC and the General Data Protection Regulation (GDPR), (Regulation (EU) 2016/679 of the European Parliament and of the Council of 27 April 2016). Gaćina Adriatic Charter stores the collected data appropriately and assures their confidentiality. Gaćina Adriatic Charter shall not forward collected data to third parties without a subject’s consent, except when it may be needed to fulfill Gaćina Adriatic Charter’s legal obligations, when it is necessary to fulfill tasks of public interests or when the subject herself has made these data publicly available and/or in other cases when it is imposed by applicable regulations. Regarding her personal data processed by Gaćina Adriatic Charter, subjects have the following rights. - existence of an automated decision-making, including profiling and its consequences. The data subject shall have the right to obtain from Gaćina Adriatic Charter without undue delay the rectification of inaccurate personal data concerning him or her. The data subject shall have the right to have incomplete personal data completed, including by means of providing a supplementary statement. Data subject have the right to have his or her personal data erased and no longer processed where the personal data are no longer necessary in relation to the purposes for which they are collected or otherwise processed, where a data subject has withdrawn his or her consent and there is no other legal basis for processing of these data, if the data have been unlawfully processed, if the data need to be erased to comply with the applicable Union law or national regulation of the member state having jurisdiction over Gaćina Adriatic Charter, if the data have been collected in relation to the information society services. This is not applied if the data processing is necessary (and to the necessary extent) in order to exercise the right of freedom of expression and information, for compliance with a legal obligation which requires processing by Union or Member State law to which the Gaćina Adriatic Charter is subject or for the performance of a task carried out in the public interest or in the exercise of official authority vested in Gaćina Adriatic Charter, for reasons of public interest in the area of public health, for archiving purposes in the public interest, scientific or historical research purposes, for the establishment, exercise or defense of legal claims. The data subject has the right to object, on grounds relating to his or her particular situation, at any time to processing of personal data concerning him including profiling where the processing of the personal data is necessary for the performance of a task carried out in the public interest or in the exercise of legitimate Gaćina Adriatic Charter's or third parties interest. Gaćina Adriatic Charter shall no longer process the personal data unless Gaćina Adriatic Charter demonstrates compelling legitimate grounds for the processing which override the interests, rights and freedoms of the data subject or for the establishment, exercise or defense of legal claims. DESIGN, in a structured, commonly used and machine-readable format and have the right to transmit those data to another controller without hindrance from Gaćina Adriatic Charter if data processing is based on his or her consent and the data are being automatically processed. Where technically feasible and when it does not impair other people's rights and freedoms, the data subject has the right to have the personal data transmitted directly from Gaćina Adriatic Charter to another. The subject's consent is one of legal basis for processing the data concerning a data subject. The data subject has the right to withdraw his or her consent at any time. The withdrawal of consent does not affect the lawfulness of processing based on consent before its withdrawal. Data subject has the right to demand restriction of processing of his or her personal data if he or she contests the accuracy of the personal data, for a period enabling Gaćina Adriatic Charter to verify the accuracy of the personal data; if his or her data have been unlawfully processed and he or she does not demand deletion, but only restriction of processing; if Gaćina Adriatic Charter does not need his or her data any more, but it needs they exist to exercise or execute its legal claims. If he or she objected to processing of his or her personal data, the subject has the right to demand restriction of processing for the period needed to establish whether the Gaćina Adriatic Charter's legitimate grounds of the controller override his or her rights from his or her objection. To exercise his or her rights, the data subject should contact the Data Protection Officer, by sending a written notice or a request to the Gaćina Adriatic Charter's Data Protection Officer, by e-mail, using the e-mail address he or she obtained from Gaćina Adriatic Charter, or by street mail to the address: Bana Josipa Jelačića 13 b, 22 000 Šibenik, i.e. to the physical address of Gaćina Adriatic Charter LLC under condition that I request the exercise of my rights by an e-mail to the above mentioned address or submitting a written personal notice personally announced before by phone to the number +385 (0)91 2100 100, and identifying myself with a valid personal ID. All inquiries regarding the protection of personal data should be addressed to the Data Protection Officer. - Should not be transferred to another country or a territory outside the EU unless that country or territory assure an adequate protection of subject's rights and freedoms relating to the protection of personal data. - Take all due care to enable the execution of the rights of the persons whose data are being processed. - Establish clear procedures to react to the requests based on the right to information. Gaćina Adriatic Charter can publish, on their web site, the contents of the cookies used to advertise and produce statistics of web traffic based on interests and information from the web page visitors from social networks. If a data subject uses a Gaćina Adriatic Charter’s social network or application content, a cookie from these sites or application could be stored on a subject’s device used to access the Gaćina Adriatic Charter’s web page. Visitors have right to disable the cookies. Web browsers are usually set so that they accept cookies by default, but the data subjects can easily change this setting in their browsers. If a data subject wants to limit or block all cookies including Gaćina Adriatic Charter 's web sites and applications (which can be prevent the use of some parts of these web sites) or other web sites or applications, the subject can do it in his or her web browser settings. When the personal data breach is likely to result in a high risk to the rights and freedoms of natural persons, Gaćina Adriatic Charter shall communicate the personal data breach to the data subject without undue delay unless Gaćina Adriatic Charter has implemented appropriate technical and organizational protection measures, and those measures were applied to the personal data affected by the personal data breach, in particular those that render the personal data unintelligible to any person who is not authorized to access it, or unless Gaćina Adriatic Charter has taken subsequent measures which ensure that the high risk to the rights and freedoms of data subjects is no longer likely to materialize or if it would involve disproportionate effort. In this, latest case, Gaćina Adriatic Charter will use public communication or a similar measure to assure that the data subjects be informed in an equally efficient way. Gaćina Adriatic Charter reserves its right to update this Policy as deemed necessary to maintain the best practices and to assure its compliance to any changes or amendments regarding the protection of personal data.